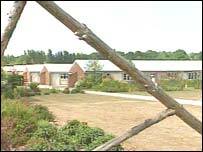 A Derbyshire prison has defended its security record even though 350 inmates have absconded in the last five years. Bosses at Sudbury Prison have blamed the problem on the pressure of having more inmates. Home Office figures show since April 2003, 50 prisoners have walked out of the open jail, compared with 67 for the whole of 2002. West Derbyshire MP Patrick McLoughlin has called for action amid concerns about the cost to local police of recapturing the escapees. Sudbury is the country's largest open jail and officials claim its record compares well with other prisons, particularly under the pressure of an increasing prison population. Governor Chris Davidson said: "No escape or abscond is acceptable, it is a serious offence. "But open prisons are open, there are no fences and we've got a much lower level of staff. "I could never say that we could prevent absconding, it's impossible." He also said the prison has to rely on the correct assessment of prisoners before they are moved to the site. Mr McLoughlin, is calling for the public to be reassured about the type of people escaping from the jail. "There is a responsibility on the prison service to make sure those people that go to Sudbury are people that they have confidence in that they will not abscond."